The shop is owned and operated by Massimo DiMarco, a certified Piaggio mechanic. Massimo’s is a full service Vespa Shop in the great Italian tradition. Whatever you need done to your Vespa motorscooter can be done at Massimo’s. You can have your Vespa tuned and repaired. Massimo takes pride in the fact that he has been repairing Vespas since he was twelve years old back in Italy, where scootering is a way of life. He has now brought all his knowledge to California and his shop in Costa Mesa. 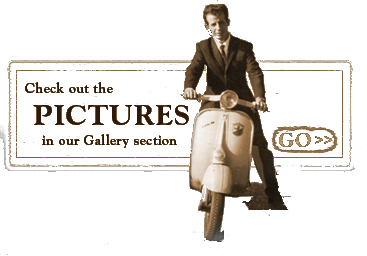 Come by and visit Massimo’s Vespa Shop for all your Vespa scooter needs.